Also, the G1 Victoria Mile is on TVG tonight! WarEmblemluvr wrote: Also, the G1 Victoria Mile is on TVG tonight! Here are links to JRA race programme. Omega Emblem(JPN), 2009M. o/o Omega Grace(JPN) by Sunday Silence(USA), won in Tokyo 8R 1600m dirt allowance on May 17th. Risvegliato(JPN), 2010C. o/o Ballet Blanc(JPN) by Dance in the Dark(JPN), won in Kyoto 9R 1600m turf allowance May 24th. 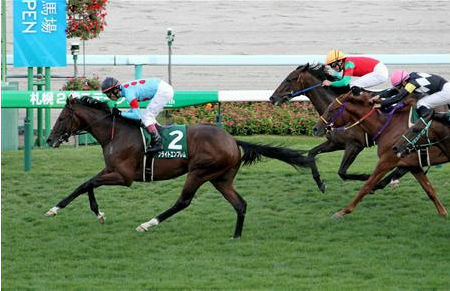 Amazing Tact(JPN), 2010C. o/o Alluring Act(JPN) by End Sweep(USA), finished 2nd in Kyoto 10R A.T.C. Sydney Trophy 1200m dirt allowance May 24th. El Mambo(JPN), 2010C. o/o T.H.Mambo(USA) by Kingmambo(USA), finished 3rd in Tokyo 10R Koremasa Tokubetsu 2100m dirt allowance May 24th. Any early babies from this group? Should be exciting - lots of excellent sires! I was wondering how Testament was doing and if he has raced recently? El Mambo(JPN), 2010C. o/o T.H.Mambo(USA) by Kingmambo(USA), won in Tokyo 7R 2100m dirt allowance June 7th. Robe Tissage(JPN), champion 2yo filly in 2012, finished 2nd in the G3 Hakodate Sprint Stakes 1200m turf at Hakodate on June 22nd. Bright Emblem(JPN), 2012C. Neo Universe(JPN) x Black Emblem(JPN) by War Emblem(USA), won in his debut going 1600m turf at Tokyo 5R Newcomer on June 28th. Bright Emblem is trained by Shigeyuki Kojima who also trained Black Emblem. Hi Tachyon, any news on War Emblem or his offspring? Bright Emblem was impressive and looks big and beautiful. any more races for him or Robe Tisage, El Mambo, etc? I just had my first baby - a beautiful daughter on July 19th and lost alot of blood, etc., so still recovering. So I have been out of touch of sorts. Hope everything is well. WarEmblemluvr wrote: I just had my first baby - a beautiful daughter on July 19th and lost alot of blood, etc., so still recovering. I'm so happy to hear about your new baby girl, WarEmblemluvr. I pray for you and your baby to be healthy! Bright Emblem, impressive maiden winner, is likely to run in a G3 in his second outing next month. Robe Tissage has been in summer break. She might run in the G3 Keeneland Cup in two weeks, too. Champion 2yo filly comes back to the winner's circle!!!!! 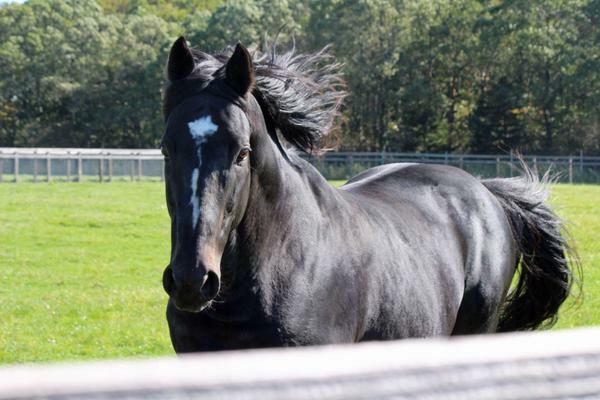 Robe Tissage(JPN), 2010 black filly. out of Petit Noire(JPN) by Singspiel(IRE), wins the G3 Keeneland Cup 1200m turf at Sapporo on August 31st. Sooooo glad that she finally got back to her own self!! I guess that she will be pointed to the G1 Sprinters Stakes next. Here's the youtube replay (long version) of the G3 Keeneland Cup and more picks of the winner Robe Tissage!!! Sunrise Arbre(JPN), 2011C. out of Lovely Princess(JPN) by End Sweep(USA), broke his maiden going 1700m dirt Kokura 2R August 31st. Godard(JPN), 2010C. out of Cecile Cut(JPN) by Sunday Silence(USA), scored his third career win going 1700m dirt allowance Kokura 8R August 24th. So glad for the awesome news on Robe Tissage! I watched the replay and will check out the youTube version! I look forward to her next race! And thanks for the congrats Tachyon! My baby girl's name is Bella. For sure she will know about War Emblem ha ha! I just saw your post from yesterday as well - great news about the other wins!!! I will check them out. Any news on War Emblem himself? tachyon wrote: Bright Emblem(JPN), 2012C. Neo Universe(JPN) x Black Emblem(JPN) by War Emblem(USA), won in his debut going 1600m turf at Tokyo 5R Newcomer on June 28th. Bright Emblem wins the G3 Sapporo Nisai Stakes 1800m turf impressively on Sep 6th. He emerges as a big hope for 2015 classic races. Look at the #2 horse who comes flying from the rear! This is AWESOME news!!! When I click on the link you gave it doesn't bring up the right thing to look at the video or it doesn't know what to do. Is there another link? I am soooo excited!!! WarEmblemluvr wrote: This is AWESOME news!!! When I click on the link you gave it doesn't bring up the right thing to look at the video or it doesn't know what to do. Is there another link? I am soooo excited!!! Here's a youtube video (long version). His trainer Shigeyuki Kojima was absolutely delighted by his graded win. 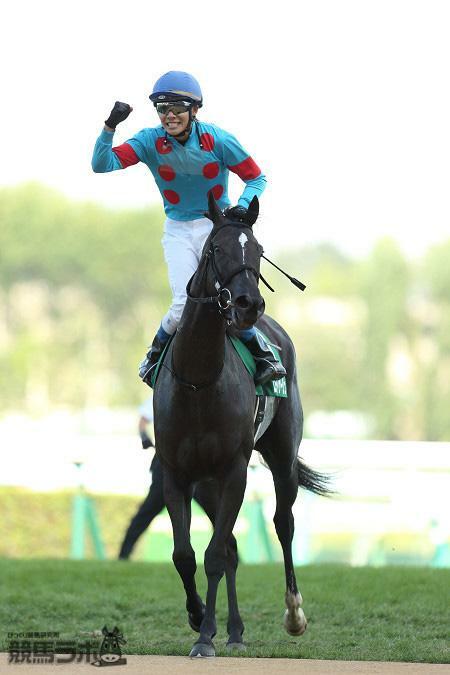 Kojima was given his first grade (and grade one) win by his trainee Black Emblem six years ago. Interestingly, Robe Tissage and Bright Emblem wear the same silk. 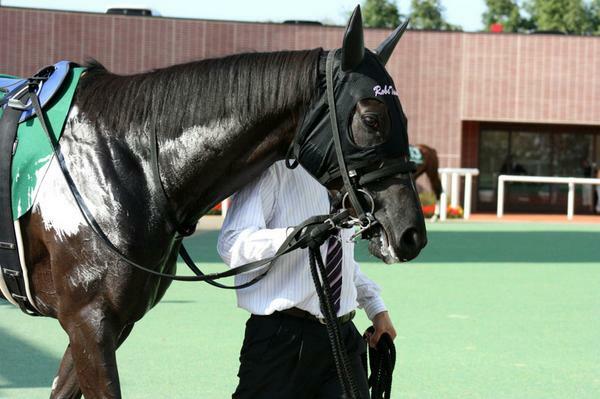 Both are owned by the same owner, Silk Co. Ltd.
Amazing Tact(JPN), 2010C. o/o Alluring Act(JPN) by End Sweep(USA), won in the Shukugawa Tokubetsu 1200m dirt allowance Hanshin 9R on Sep 14th, 2014. Narita Super One(JPN), 2009H. o/o Marseille Cat(JPN) by French Deputy(JPN), finished 3rd in the Enif Stakes (Listed) 1400m dirt Hanshin 11R on Sep 13th, 2014. 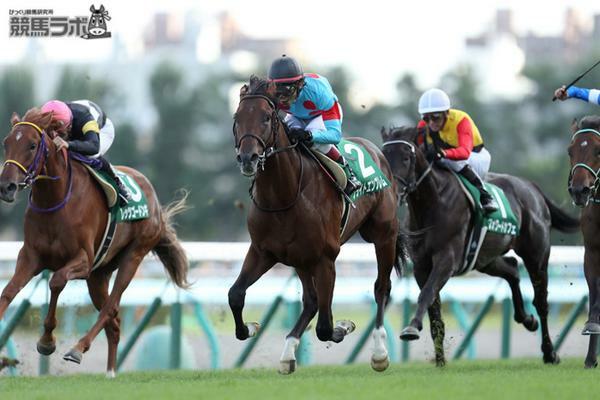 Robe Tissage is slated to run in the G1 Sprinters Stakes 1200m turf at Niigata on Oct 5th. This must be a new pick of War Emblem.